I started thinking about hiking the Jesus Trail almost a year ago. I'd always wanted to see the actual sites of the Bible stories I'd grown up hearing. But a big tour group didn't seem right for me. I wanted more time for reflection, more flexibility, and more quiet. Enter the Jesus Trail. 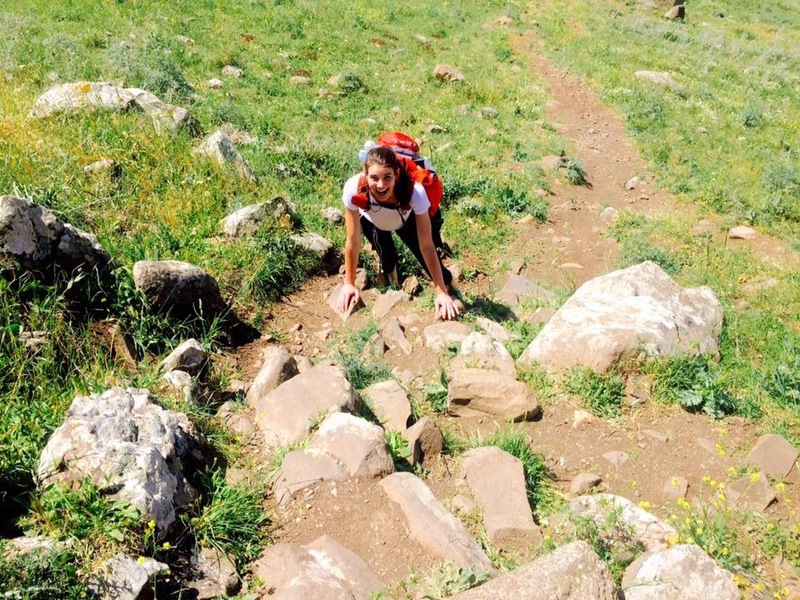 The Jesus Trail is a 65km hiking trail that takes you from Nazareth to Capernaum. This is a route likely walked by Jesus, as he grew up in Nazareth and later lived in the Capernaum area. 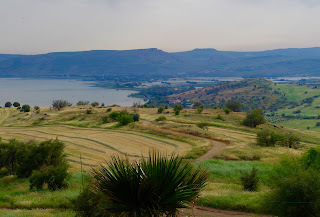 Landmarks along the trail include the site of His first miracle (turning water into wine), the site of the feeding of the 5,000, and the Mount of the Beatitudes (blessed are the peacemakers, etc). But they also include olive trees, wheat fields, goats, and manure. To me, it was just as special to observe these mundane sights and sounds and smells that would have filled Jesus' senses throughout his life. Goa, India to Jerusalem, Israel. It was a 3-flight, 23-hour ordeal, but fortunately everything went more or less as scheduled, and I was able to squeeze in 6 good hours of sleep before boarding the morning bus to Nazareth to meet my friend Jessica. I had been hesitant to pay the big bucks to join a group hike of the otherwise-free trail, but equally hesitant to attempt a solo hike of unknown difficulty in an unknown country. So, on a whim and with little hope, I sent out one last invitation to some friends from home. To my delight, Jessica bought her ticket to join me with about three weeks to spare! After a delicious falafel and a quick stop at Mary's Well, we made our way out of Nazareth. Finding the trailhead was half the battle. 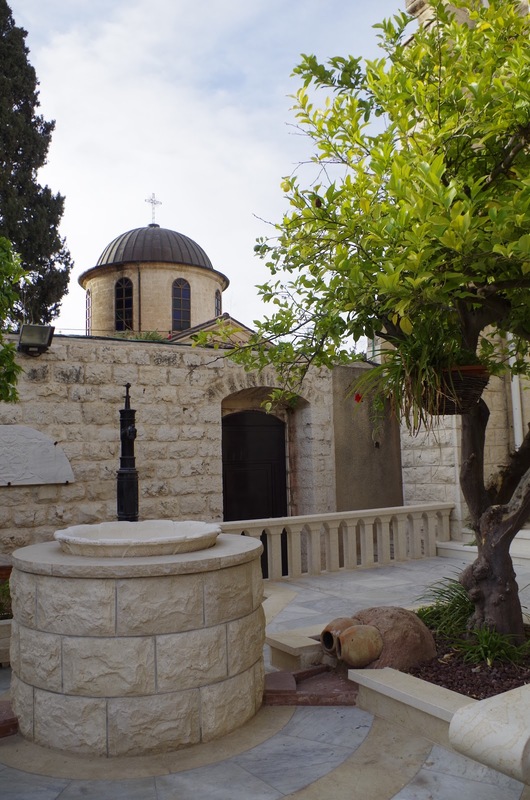 Present-day Nazareth is a predominantly Muslim town, and though the residents were super friendly and eager to help, most of them had never heard of the trail. Luckily, we had downloaded the non-web-based TRAILZE app on the advice of the Jesus Trail representative with whom we'd been emailing... the man we alternately called "the Jesus Trail guy," "Jesus," and "Mark Gordon" (his actual name) as we repeatedly relied on his advice. Mark Gordon for President. Seriously, if you ever do the trail, do it with TRAILZE. And Mark Gordon. The first day of the trail was stunning and relaxing. The distance was short, the inclines were rare, and the wild flowers were in full bloom. Spring is such a beautiful time in Israel. We chatted, reflected, and struggled to wrap our heads around the idea that Jesus actually walked here. 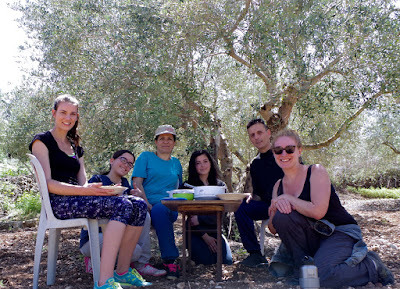 We prayed while eating hummus in an olive grove. We got chills when we saw the verse describing Jesus' first miracle inscribed on the actual site of Jesus' first miracle. We made it to our guesthouse before dark. We had tea with our sweet hosts and their adorable daughter, and we met Steven, the one and only fellow pilgrim we'd encounter in the next four days. The three of us slept soundly in a guesthouse built for 20. Because of guesthouse availability, our second day was our shortest. 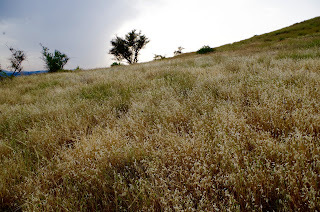 We got a leisurely start, and continued meandering over gentle hills covered in wheat and wild flowers. We got a little lost, but weren't concerned because we knew we had plenty of time. And TRAILZE. Our creative route led us directly to a sweet and generous family's beautiful mountainside olive grove. In their warm hospitality, they invited us for coffee immediately. As we continued talking, we connected over our common beliefs, sampled herbs growing wild in the grove, played rock-throwing games, and laughed a lot. They even invited us to share in their amazing picnic of tabouleh, fruit, and homemade stuffed grape leaves and eggplant. And such good dessert. It was a perfect afternoon -- we coudn't be more grateful for their generosity! We said bittersweet goodbyes and continued on the trail. After only one or two hours, we arrived at our farmstay. I was in heaven. We hadn't requested homemade meals in time, but we still got to play with goats and hang out with their (unofficial) WWOOF'er. We got some life advice from Steven and then got a great night's sleep in anticipation of our hardest day. Jessica and I patted ourselves on the back for finding the beginning of the "difficult" section relatively easy. We walked up slightly steeper hills, and detoured around flooded tunnels -- the trail was a little more rugged, but highly doable. We were relieved and empowered. And so naive. Hot and hungry and hopeful that a potential lunch stop was just around the corner, we arrived at the Horns of Hattin. This is not a good stretch of trail to try when you are already hot and hungry. We were on a bit of a high from our first sighting of the Sea of Galilee, but we weren't seeking out extra challenges. They found us anyway. We probably came as close to rock climbing as you can come without actually rock climbing. We awkwardly balanced our big backpacks and our dwindling water. 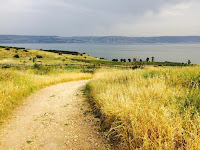 We remained invigorated by the sight of the Sea of Galilee, and we appreciated the water we did have. But each time we looked below us and realized we were looping back toward a bit of trail we'd just completed, we couldn't help but get annoyed. It appears that this climbing stretch is easily skip-able, and doesn't include any extra Jesus sites. We finished it with a sense of accomplishment which I would have gladly traded for a little bit of foreknowledge and an alternate route leading to an earlier lunch. When we finally arrived at our final guesthouse, we collapsed on the couch, and could have kissed the host who gave us a giant pitcher of water and free bananas. We jumped in the pool (pool!) almost immediately, and all was right with the world again. With the longest day behind us, we dragged our sore calves onto the home stretch. Our hosts armed us with more fruit and some stern advice about drinking water. This day would start with a difficult stretch too. Here goes. We climbed a steep hill and begrudgingly paid the unexpected entrance fee for the Cliffs of Arbel. The view of the Sea of Galilee was stunning, but I was preoccupied by the guard's serious warning about holding on while descending, and the signs declaring that these routes were only for experienced hikers. I was anxious, but tried to talk myself down when I realized a high school group would be descending the same route. Did I mention this route went down the face of the cliff? Luckily the large size and slow speed of this group was enough to deter Jessica, so she suggested we go for plan B. I was so relieved. We retraced our steps, agreeing that the views had been worth it anyway, and then began our slow descent into the valley. It was easy to picture Jesus chatting with His friends while sitting on the white rocks studding the beautiful meadow. 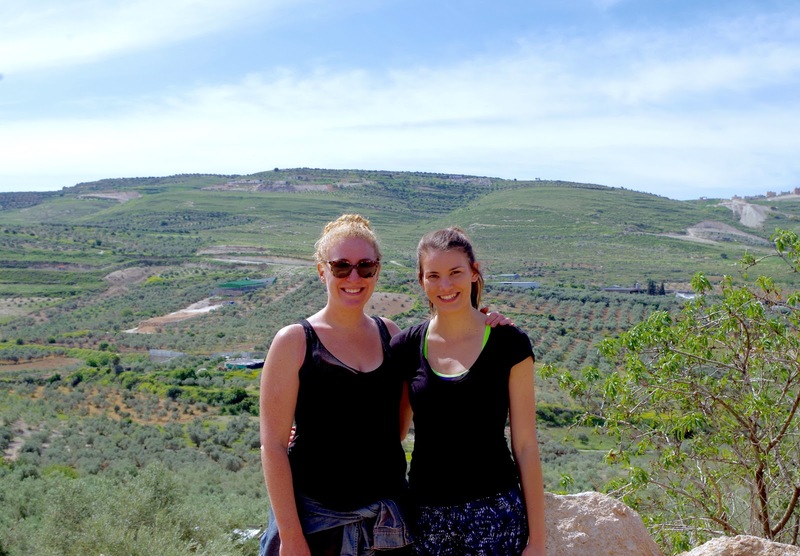 We spotted some cute little animals and some Maccabean ruins. We listened to music and paused to take pictures of the incredible windflowers. And at the end, of course, we ran into Steven. 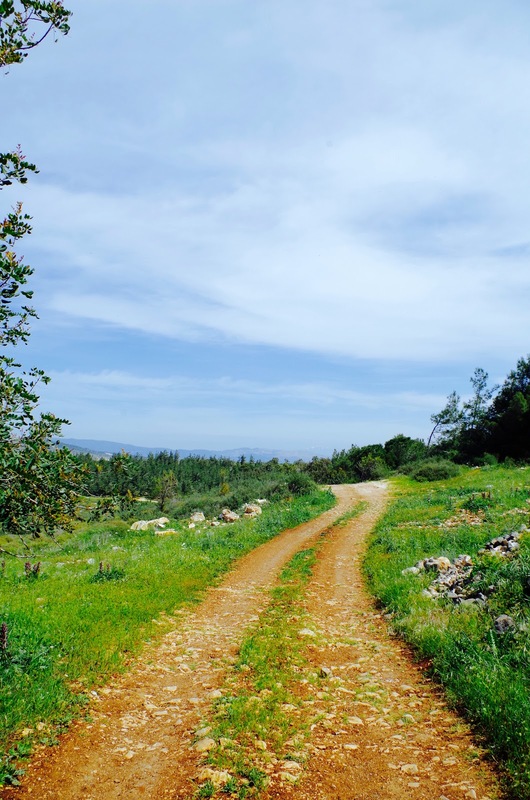 We ate still more delicious falafel in Mary Magdalene's hometown, and continued on the section of trail designated as "easy." This time, we agreed! 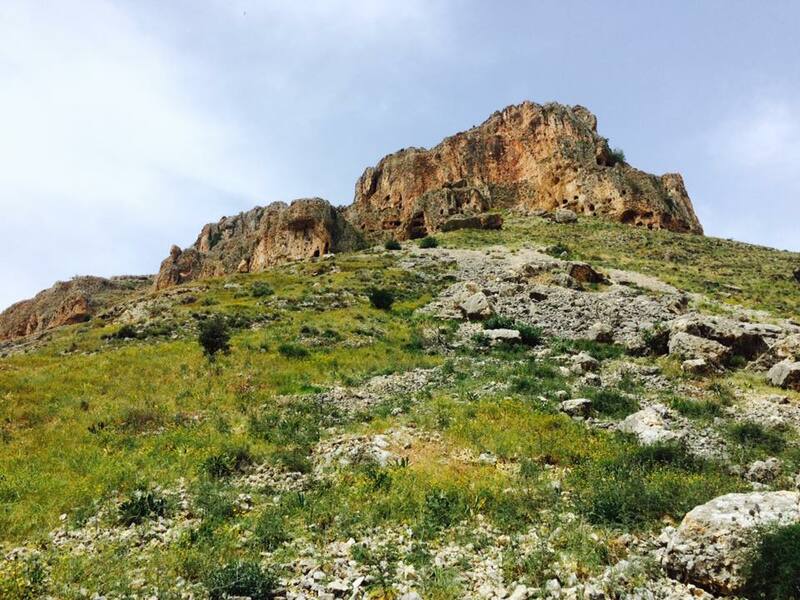 We meandered the flat paths and visited the sites of the feeding of the 5,000 and of the Sermon on the Mount. 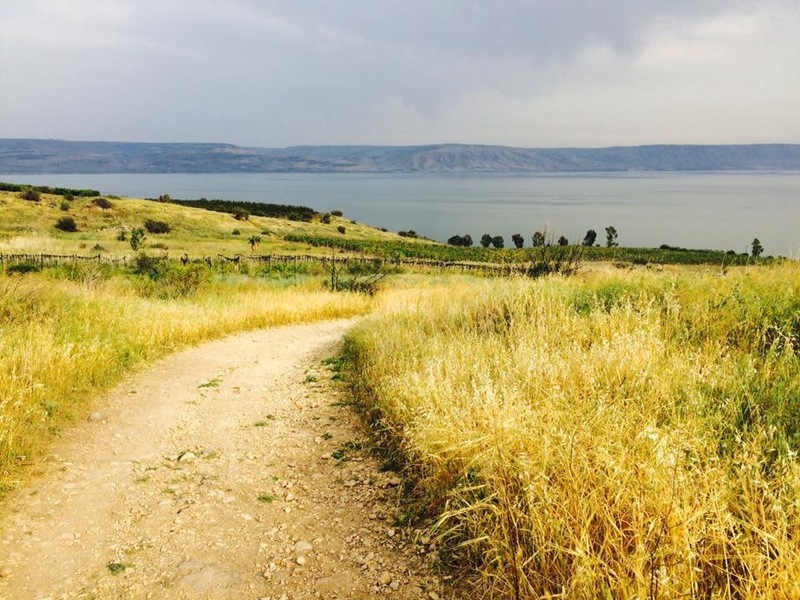 We took off our shoes and waded in the Sea of Galilee, overcome by the history it represented. We savored convenience store ice cream bars. Capernaum. We made it. It's funny, you'd think my big takeaway would have something to do with standing where Jesus stood, smelling what he smelled, touching what he touched. Those things were so powerful, they really were. But on the trail and afterwards in Jerusalem, my predominant and weirdly comforting thought was that this location doesn't actually hold the magic I'd expected. Ours is a faith that says that He lives in us, not in a beautiful stretch of trail in the Middle East. There is nothing I can achieve by being in this location that I couldn't achieve at home. There is nothing I'll lose when I leave here. As cheesy as it sounds, my mind's response to my almost superstitious fixation on this pilgrimage was Matthew 28:6. "He is not here, for he has risen, just as he said."